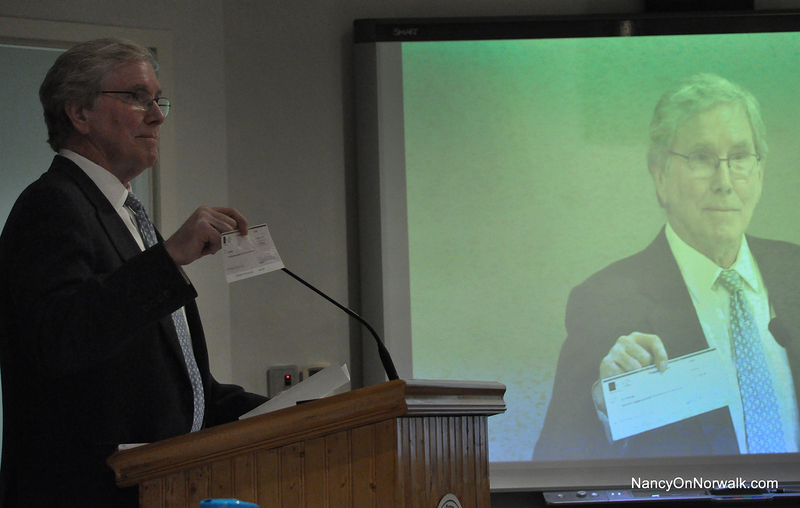 Manresa Association President Charlie Taney in December 2016 shows the Common Council a $75,000 cashier’s check, the Association’s contribution to a $150,000 Manresa Island economic impact analysis. Updated, 12:56 p.m.: Comment from Travis Simms. The $150,000 Norwalk Power Economic Impact Analysis, which details Manresa Island’s features and makes recommendations for possible developments to replace its defunct power plant, was well worth the investment, Manresa Association President Charlie Taney said Friday. “It’s kind of exciting, to have identified these really interesting possibilities for the property, that the community has identified and kind of gathered around. Now we can work with the property owners, NRG, and with our local publicly elected officials, our state electoral officials and our federal electoral officials and come together, and work together to make sure that things happen out there,” Taney said. The Manresa Association and the City split the cost of the study 50-50, in what they described as a public-private partnership. “Now phase II is how do we now realize the potential of that incredible property? Phase II is realizing the potential we have now identified,” he said. The City’s press release called the study “two years” worth of work, but efforts that led to its completion go back five and a half years, Taney said, when the plant closed and many people got to work. The partnership with the City was fun, he said. “I think the public private partnership of the City of Norwalk and the Manresa Association really got their money’s worth,” Taney said. Former Common Council member Anna Duleep on Thursday slammed State Rep. Travis Simms (D-140) over a bill he has proposed. Duleep was campaign manager for Colin Hosten, who challenged Simms in a Democratic primary and then continued as a candidate to the election under a Working Families Party endorsement. Norwalk Democratic Registrar Stuart Wells in September said that Hosten is a citizen. State Senate Majority Leader Bob Duff (D-25) said last week that approximately 5,000 bills are proposed in this beginning stage of the legislative session, and only about 250 will become law. John Mosby’s attempt to recover damages for what he called discrimination by the Board of Education has been thwarted. In a decision set to be officially released Tuesday, the Appellate Court has upheld the trial court’s decision to dismiss the case after Mosby missed the deadline to begin the lawsuit. Mosby alleged discrimination because he had been asked to show identification at Brien McMahon High School, discrimination in Board hiring practices, and discrimination in the poor condition of the then-Briggs High School. NancyOnNorwalk was alerted by a reader to the decision, with a link to the Connecticut Judicial Branch law libraries newslog. Mosby first filed a complaint with the Commission on Human Rights and Opportunities (CHRO), then obtained a release of jurisdiction on Feb. 18, 2016, the court decision states. The lawsuit deadline was May 18, 2016, and Mosby argued that the suit had been filed on May 9, 2016 but the suit did not commence until the defendants were served. Mosby, who was self-represented, argued that the action would have been timely if the process had been delivered to Constable Ernie Dumas before the 90 days had ended, the decision states. “It is well established that, in Connecticut, ‘an action is commenced not when the writ is returned but when it is served upon the defendant,’’’ the decision states. The original lawsuit was dismissed on Nov. 8, 2016, it states. Mosby has filed numerous lawsuits and complaints with CHRO alleging discrimination by the Board of Education; none have been successful in recent years. In 1996, then-Norwalk Superintendent of Schools Ralph Sloan wrote that Mosby had filed more than 50 complaints with the state Labor Board in his capacity as president of the custodians’ union. Mosby is the lead plaintiff in another case in front of the Appellate Court, representing retirees who state that the BoE and the United Public Employees Union (UPEU) breached the terms of their collective bargaining agreement, in regard to their retirement medical insurance coverage. He is, again, self-represented and had a Thursday deadline to file a brief in reply to one filed Jan. 1 by Norwalk Deputy Corporation Counsel Jeffry Spahr. The State courts website does not show a brief filed by Mosby. “Who is dredging at Village Creek? Planning and Zoning does not know. Public Works does not know. Neither City environmental head knows,” former State Rep. candidate John Flynn wrote in a Jan. 24 Facebook post. “The dredging is being managed by the Village Creek Harbor Corporation, which has coordinated dredging at various times in the past to maintain water depth,” Colin Hosten, Village Creek Homeowners Association President, wrote to NancyOnNorwalk on Jan. 25. “Village Creek Harbor Corporation (a volunteer organization) maintains and administers the Village Creek Marina. 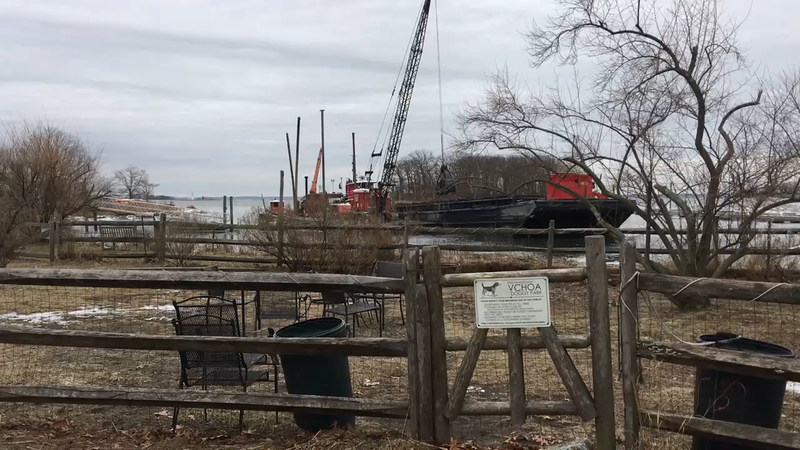 The Marina is privately owned by the residents of Village Creek via the Village Creek Home Owners Association,” Village Creek Harbor Corporation Vice Chairman Paul Braschi wrote to NancyOnNorwalk on Jan. 26. “Every summer roughly 1/2 of the 60 slips are rented to Non-Village Creek Residents – mostly residents of Norwalk. In water ‘wet’ winter storage is available for boats to 40’. There are no shore side amenities for non-resident slip holders. Village Creek’s short channel and excellent location enables boaters to throttle up more quickly than almost any marina in Connecticut. “The marina was completely rebuilt and the basin maintenance dredged in 2012. Gary Wetmore at G&C Marine Services – Norwalk built and installed the docks. Each year as finances and volunteer time allows the marina continues its build out, adding one finger pier at a time, climaxing this year with the addition of 8 small boat slips for whalers, inflatables and other small boats. Power and water were added in 2012. “In compliance with Army Corps of Engineers, CT DEEP and numerous other agencies maintenance dredging of 18,000 cubic yards is underway. Dredging should be completed by January 31st. The basin will be dredged to 8’ MLW and the channel to 4’ MLW. Eric Hanson at Hanson Marine Contractors – Stamford is our dredging contractor. We have partnered with William W. Seymour & Associates – Darien for our underwater surveying needs. “Village Creek raises its funds though community bonds which finance the periodic maintenance dredging operations. No Federal, State or Local monies are or have ever been involved with our maintenance dredging or facility restoration. NancyOnNorwalk has heard the Village Creek dredging mentioned at multiple City meetings. Why is asking for proof of Citizenship prior to running for public office a bad thing? Link to VC’s dredge & fill permit on the DEEP website? Minutes from a CAM review bt the harbor commission? ACOE approval? This is what makes me crazy about Norwalk. Deep water property at the mouth of the Norwalk Harbor and we are talking ” wind farms ” ? How about something high end with high end taxes for the City. In ten years we are going to have to figure what to do with a closed Mall , any chance the tree huggers can go to the back of the line ???????? Over the decades many thoughtful long time residents have asked why City officials writ large have never supported a 4 year college. Noting that Norwalk, even though its the County’s most transient City, is our State’s only City without a 4 year college. Sadly no City official has ever supported this idea. Maybe a CC is just “good enough”. Manresa could open up the discussion again. All that’s needed is for the Council to form a Committee of Concerned citizens and request our local Legislators to open up the relevant doors in Hartford. Why ? Transient commuter cites have limited prospects. Witness our decades long stagnant Grand List amidst a robust national economy. Second, Norwalk doesn’t offer a well trained local labor force attractive to modern hi-tech firms. A 4 yr college would remedy that. Finally, there’s a broad economic regional literature over the decades suggesting strong economic benefits from siting 4 year colleges. So who will take the first step in Norwalk ? ALL this info from a simple google search! It might beg the question, “why was this news?” but I’ll let our like-minded conspiracy theorists answer that one. Manresa is privately owned, so any planning for it is based on aligned goals with the property holders. offer space at Manresa to Devine brothers, the marina north of the wail bridge, and anyone else who requires shipping past the Walk Bridge. Remediate the river north of the bridge. Then, here’s an idea, make a fixed railway bridge.